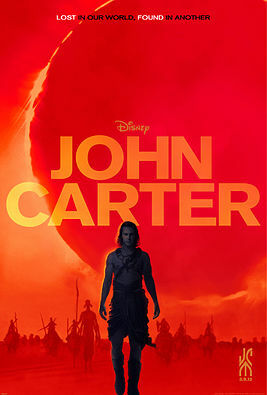 Walt Disney Pictures presents the 3D epic, action‐adventure “John Carter” which is based on the Edgar Rice Burroughs classic, “A Princess of Mars”. "John Carter” is set on the mysterious and exotic planet of Barsoom (or better known to humans as the planet Mars). The film tells the story of former military captain John Carter (Taylor Kitsch) who is inexplicably transported to Mars where he becomes reluctantly embroiled in a conflict of epic proportions amongst the inhabitants of the planet. In a world on the brink of collapse, Carter rediscovers his humanity when he realizes that the survival of Barsoom and its people rests in his hands. More info and the latest trailer of the "John Carter" can be found after the jump. 2012 actually marks the 100th anniversary of Burroughs’ character John Carter, the original space hero featured in the series, who has thrilled generations with his adventures on Mars. Over generations, John Carter has become a heroic paradigm across all forms of pop culture. From novels to comic books, artwork to animation, TV and now cinema, the character has inspired some of the most creative minds of the last century. Andrew Stanton directed and co‐wrote the screenplay for “WALL‐E” which earned the Academy Award® and Golden Globe® for Best Animated Feature in 2008. His directorial debut is with “Finding Nemo”, another award-winning film. Opening across the Philippines sometime in March 2012, “John Carter” is distributed by Walt Disney Studios Motion Pictures International through Columbia Pictures. This is definitely one of the films to watch out for this 2012.